M-42 and M-44 Buran trisonic ramjet missiles were considered in both manned and unmanned versions. Russian intercontinental cruise missile. Cancelled 1957. Several variants of the Myasishchev Buran trisonic intercontinental cruise missile M-42 cruise stage were studied, including a piloted version. AKA: Buran;M-42;RSS-52. Status: Cancelled 1957. Payload: 2,300 kg (5,000 lb). Thrust: 103.90 kN (23,358 lbf). Gross mass: 50,000 kg (110,000 lb). Unfuelled mass: 12,000 kg (26,000 lb). Specific impulse: 1,500 s. Height: 28.00 m (91.00 ft). Diameter: 2.40 m (7.80 ft). A government decree on 20 May 1954 authorized the Myasishchev aircraft design bureau to proceed with full-scale development of the Buran trisonic intercontinental cruise missile. The competing Burya design of Lavochkin was launched in July 1957, but the development of unstoppable ICBM's had made intercontinental cruise missiles obsolete. The equivalent American Navaho project was cancelled ten days later. Korolev's R-7 ICBM completed its first successful test flight in August. Buran was being prepared for its first flight when Myasishchev's project was cancelled on November 1957. In both America and Russia design studies by captured German rocket engineers were commissioned for a high altitude cruise missile based on the Peenemuende work. In Russia, Albring designed the R-15 missile for the Russians in October 1949. This would use a rocket-powered Groettrup-designed R-10 as the first stage. The cruise stage would have an aerodynamic layout like that of the Saenger-Bredt rocket-powered antipodal bomber of World War II. Boris Chertok of NII-8 took this preliminary design and elaborated it, including consideration of the key problem of long-range automatic astronavigation. Von Braun's team in America had designed a similar Hermes cruise missile in New Mexico in 1946. This used a V-2 as the first stage. The Hermes concept was elaborated by North American Aviation into the Navaho cruise missile. While these preliminary studies were underway the United States developed plans for delivery of nuclear warheads on the cities of the Soviet Union. Stalin's response to this threat was authorization to begin development of means of nuclear attack of the United States. Veteran aircraft designer Tupolev was tasked with development of an intercontinental bomber, while young rocket designer Korolev was to develop an intercontinental ballistic missile. After initial study Tupolev reported that it would not be possible to develop an intercontinental bomber using jet engines; his Tu-95 would use German-designed turboprops. However another designer, Myasishchev, claimed to be able to design an intercontinental jet bomber. Accordingly the Central Committee decree on 24 March 1951 created the OKB-23 Myasishchev design bureau. Myasishchev managed to complete the first prototype 103M (called M-4 Bear in the West) bomber ten months after go-ahead (compared with four years for the B-52). The 103M represented a tremendous increase in Soviet technology: altitude was increased by 50%, range doubled, and takeoff mass was four times greater than any previous Soviet aircraft. The United States had meanwhile pursued development of the B-52 intercontinental jet bomber and Navaho cruise missile while declining to develop ballistic missiles. This difference with the Soviet bomber/ballistic missile approach led Keldysh to from a group that raised the question of Soviet development of a similar long-range unpiloted aircraft. In 1951 to 1953 Korolev's design bureau had prepared an experimental design, the EKR. I Lisovich had developed a prototype astronavigation system that met the necessary specifications, and solution of basic problems in use of steel and titanium hot airframe technology had been solved at VIAM (All-Union Institute of Aviation Materials) and MVTU Bauman Institute. An expert commission in 1953 examined the EKR design and felt that there were still many technical problems to be solved, most of which were better handled by an aircraft designer rather than Korolev. Further, Korolev had to place the highest priority on development of the R-7 ICBM. 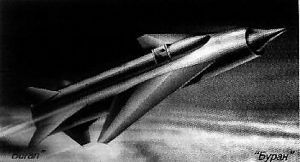 Therefore a final government decree on 20 May 1954 authorized the Lavochkin and Myasishchev aircraft design bureaus to proceed in parallel with full-scale development of trisonic intercontinental cruise missiles. Both missiles would use ramjet engines by Bondaryuk, astronavigation systems by R Chachikyan, inertial navigation systems by G Tolstoysov, and aerodynamics developed by TsAGI (Central Hydrodynamics Institute). Lavochkin's Burya would use rocket booster engines built by Glushko, while Myasishchev's Buran would use Isayev engines. Both missiles were to deliver a nuclear warhead over an 8,500 km range. But the warhead design specified for the Lavochkin missile had a total mass of 2,100 kg, while that for the Myasishchev missile weighed 3,500 kg. The TsAGI configuration for the cruise stage was of conventional layout, with a thin profile 70 degree swept arrow wing mounted at mid-fuselage. The fuselage itself was cylindrical and area-ruled, with the classic ramjet shock cone in a nose intake. The astronavigation and guidance systems were mounted in a dorsal fairing. The star scanners of the system looked out through quartz windows. Myasishchev had began work in April 1953, before the official authorization, on his RSS-40 (RSS= rocket-aircraft system), code-named Buran (snowstorm). The RSS-40 would consist of two stages, a four-rocket boost stage (the M-41) and a ramjet cruise stage (the M-42). The RSS-40 would be launched vertically from an ingenious transporter-launcher, designed by V K Karrask. The RSS-40 was 24 m long, had an 11.6 m wingspan, a total mass of 125 metric tons, and cruised at 3000 to 3200 km/hr. The ramjet intake cone was canted 3 degrees downward, which represented the pitch angle of the missile in cruise. Several variants of the Myasishchev M-42 cruise stage were studied. Some were related to improving the missile guidance, including an auxiliary communications package for providing en-route navigation and targeting updates, as was planned for the competing Burya. Another laid out a piloted version, with a cockpit installed in the cruise stage. The pilot would eject and be recovered by parachute at the conclusion of the mission. Myasishchev planned several manned flights to explore the psychology of human flight on the edge of space. By 1956 Myasishchev was just completing project design, while Lavochkin was already completing construction of the first missile. Burya was launched first, in July 1957, but exploded in its first launch. But events now conspired against the project. The US Navaho was cancelled ten days later. Korolev's R-7 ICBM completed its first successful test flight in August, at the same time the first two Buran missiles were completed at the factory. Buran was being prepared for its first flight when Myasishchev's project was cancelled on November 1957. The Soviet leadership did not see any need for continued development of a parallel ramjet design. Stage 1. 4 x Buran M-41. Gross Mass: 18,000 kg (39,000 lb). Empty Mass: 3,000 kg (6,600 lb). Thrust (vac): 755.000 kN (169,730 lbf). Isp: 254 sec. Burn time: 50 sec. Isp(sl): 231 sec. Diameter: 1.20 m (3.90 ft). Span: 3.00 m (9.80 ft). Length: 19.10 m (62.60 ft). Propellants: Nitric acid/Kerosene. No Engines: 1. Engine: RD-213. Status: Development 1957 November. Comments: Booster for Buran missile. Four used to boost ramjet second stage to ignition conditions. Masses estimated based on missile known total mass. Specific impulse estimated. Stage 2. 1 x Buran M-42. Gross Mass: 53,000 kg (116,000 lb). Empty Mass: 15,000 kg (33,000 lb). Thrust (vac): 103.900 kN (23,358 lbf). Isp: 1,500 sec. Burn time: 8,500 sec. Diameter: 2.40 m (7.80 ft). Span: 11.60 m (38.00 ft). Length: 23.30 m (76.40 ft). Propellants: Air/Kerosene. No Engines: 1. Engine: RD-020. Status: Development 1957 November. Comments: Boosted by 4 x Glushko-engined boosters. 8,500 km cruise at Mach 3.1 at 18-20 km altitude with 3,500 kg warhead. Wing area 98 square meters; diameter of ramjet 2.0 m. Never reached flight test. Masses estimated based on missile known total mass. Family: Rocketplane, Suborbital. Country: Russia. Engines: RD-020. Launch Vehicles: Buran M-40, EKR, R-12. Propellants: Air/Kerosene. Agency: Myasishchev bureau. Bibliography: 192, 474. 1953 January - . LV Family: R-12. Launch Vehicle: EKR. Expert commission examined the EKR design - . Nation: Russia. Related Persons: Korolev, Lavochkin, Myasishchev. Program: Navaho. Spacecraft Bus: Buran M. Spacecraft: Buran M-42. In 1951 to 1953 Korolev's design bureau had prepared an experimental trisonic ramjet design, the EKR.The expert commission ifelt that there were still many technical problems to be solved, most of which were better handled by an aircraft designer rather than Korolev. Further, Korolev had to place the highest priority on development of the R-7 ICBM. Therefore a final government decree on 20 May 1954 authorised the Lavochkin and Myasishchev aircraft design bureaux to proceed in parallel with full-scale development of trisonic intercontinental cruise missiles. 1954 May 20 - . Launch Vehicle: Buran M, Burya La-350. Soviet government decree for full-scale development of trisonic intercontinental cruise missiles. - . Nation: Russia. Related Persons: Glushko, Isayev, Korolev, Lavochkin, Myasishchev. Program: Navaho. Spacecraft: Buran M-42, Buran M-44. Council of Soviet Ministers (SM) Decree 957-409 'On transfer of intercontinental cruise missile work to the Ministry of Aviation Industry' was issued. Korolev had to place the highest priority on development of the R-7 ICBM. Therefore the final government decree authorised the Lavochkin and Myasishchev aircraft design bureaux to proceed in parallel with full-scale development of trisonic intercontinental cruise missiles. Both missiles would use ramjet engines by Bondaryuk, astronavigation systems by R Chachikyan, inertial navigation systems by G Tolstoysov, and aerodynamics developed by TsAGI (Central Hydrodynamics Institute). Lavochkin's Burya would use rocket booster engines built by Glushko, while Myasishchev's Buran would use Isayev engines. Both missiles were to deliver a nuclear warhead over an 8,500 km range. But the warhead design specified for the Lavochkin missile had a total mass of 2,100 kg, while that for the Myasishchev missile weighed 3,500 kg. 1957 November - . LV Family: Buran M. Launch Vehicle: Buran M-40. Buran trisonic intercontinental cruise missile cancelled. - . Nation: Russia. Related Persons: Lavochkin, Myasishchev. Program: Navaho. Spacecraft Bus: Buran M. Spacecraft: Buran M-42. Council of Soviet Ministers (SM) Decree 'On termination of work on the 40 Buran intercontinental cruise missile' was issued. Buran was being prepared for its first flight when Myasishchev's project was cancelled. After successful flight tests of Lavochkin's Burya missile, the Soviet leadership did not see any need for continued development of a parallel ramjet design. Following the cancellation, Myasishchev sought approval for test of an air-launched version.